Two great white shark encounters were reported this week, one of which closed the waters off Huntington Beach, California. An unidentified 14-year old boy was swimming off the beach August 24 when he saw a dorsal fin cutting the surface of the water. The teenager felt a bump as the shark hit his chest around 8 p.m. and then saw the tail fin as the shark swam away. “Based on the size of the fin, it was likely a juvenile between 5- and 8-feet long,” Lt. Claude Panis of the Huntington Beach Fire Department told the Los Angeles Times. The uninjured teen was able to safely swim 25-yards back to shore and alert authorities who closed the beach. A boat crew and helicopter were dispatched the following day to look for sharks. None were spotted, and the beach was reopened around 1 p.m. Saturday. On the opposite coast in Massachusetts Bay, Keith Ellenbogen also experienced a close encounter with a great white shark. The underwater photographer and environmental storyteller was aboard a 50-foot research vessel in the southeast corner of the Stellwagen Bank National Marine Sanctuary August 17. Ellenbogen carried his 4K 360-degree camera to capture video of the vast marine life as the group surveyed the area in rubber inflatable boat (RIB). “From the RIB we saw a dorsal fin breaking the surface and moving very slowly,” he said. The group watched the dorsal fin in an attempt to identify what type of fish was below the surface. “When it made a large circle – a behavior typically associated with basking sharks – we all agreed it was a large basking shark. “I must admit I have never seen a basking shark, and this is one of those iconic animals I was excited to photograph. The ocean conditions were perfect – no wind with calm seas that were flat like glass.” He said. The group positioned themselves up current of the shark and Ellenbogen slipped into the water. 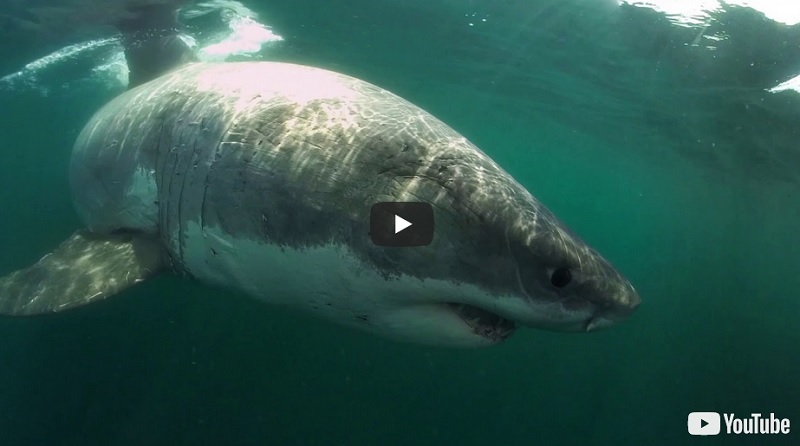 “After about 10 seconds of uninterrupted emerald green sea with dancing waves of sunlight and a feeling of excitement, I arrived within 25 feet of the shark and got my first glimpse of the animal. I immediately realized this was not a basking shark but rather an enormous great white shark swimming straight towards me, and I was swimming straight towards it!” he said. “I immediately stopped swimming forward. At that moment, time moved slowly. I was not sure what to expect from the shark and just put myself into a trance and said enjoy the moment. During this ten second encounter, I kept my heartbeat slow and steady, my body language predictable and firm and the camera stable to get the shot. “My trajectory was such that I was headed straight towards the mouth of the shark and I could not change direction. Perfect placement for a basking shark and not ideal for a great white shark. As we approached each other, I could hardly believe how big this shark was. I was approaching so close that I pulled the 3-foot pole of the 360VR camera closer to myself to avoid bumping into the animal. In the video you can see the micro movements I was making with my hand to slow down my speed and avert a crash. “As I as approached its giant face and teeth, what I remember most is its strong and direct eye contact. Fortunately, the shark did not change its behavior or trajectory. I think it was in a catatonic sleep-like state. I wonder if it’s ever been approached by another living animal before and what was it thinking? I’m fortunate, in that I have lots of experience filming other sharks such as blue, makos, and bull sharks in the wild and am comfortable in extreme situations. Panic is never a solution. I knew I was committed and that all I could do was enjoy this experience and get the shot. “It was such a beautiful, majestic animal, I’m glad I had this once-in-a-lifetime encounter, and I’m fortunate that I have the rest of my lifetime to contemplate it!” he said.